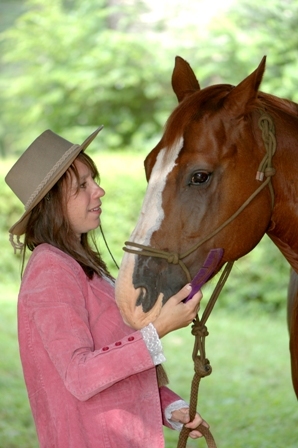 Cathy Woods, long time trail rider and yoga teacher, created this program to help horse riders explore the parallels of yoga and horsemanship. The program is designed for anyone, regardless of horse riding experience. You may think yoga is just a form of stretches done on a mat, but it is much more. It is an awareness practice. Yoga means ‘to Yoke Body, Mind, and Spirit’. If guests at a dude ranch can take lessons from the yoga mat to the saddle, they can take lessons from yoga into every aspect of their lives. It can be delivered anywhere participants can practice with their own horse or a horse-for-hire. 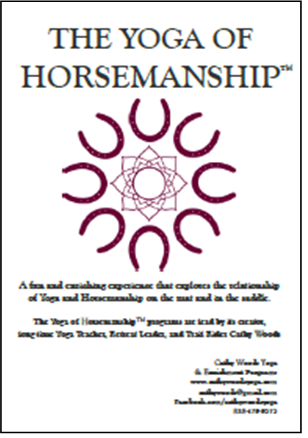 Please download this information package to learn more about the Body, Mind, Equine program. Do you ever come to the Sylva area? I ride trail and barrel racing. At 64 I am not as balanced and my core strength is very much lacking. My friend Jeannie O’Connor told me about you. Hi! I saw that you might be Coming to Colorado. I would be very interested in attending-I recently moved from the Tryon area.